The GN079WD sticky suction mounting pedestal is compatible with Garmin nuvi 40, 50, 200, 2013, 24x5, and 25x5 Series devices, as well as Garmin nuvi 1450, 1450T, 1490T, 1200, 1250, 1260T, 1300, 1350, 1350T, 1370T, and 1390T models. This mount package includes only the Sticky Suction Mounting Pedestal with 3-inch articulating arm and 17mm ball head, and an optional 3M adhesive dashboard mounting disk. (The above listed Garmin nuvi devices should include a 17mm swivel ball-compatible holder; replacement holders sold separately.) 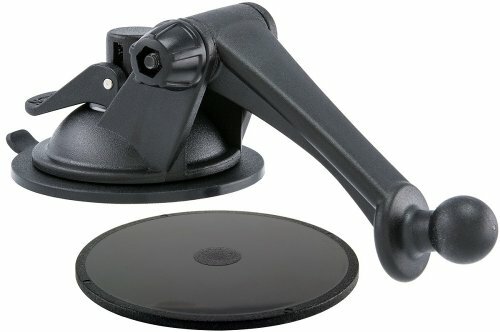 Replace that tired old Garmin suction mount that always falls off with Arkon's new sticky suction mount. The Sticky Suction Mounting Pedestal is ideal for car dashboards, windshields, and other flat or slightly textured surfaces. The pedestal's base uses a powerful combination of polyurethane gel and suction to provide a maximum surface bond. The 3-inch articulating arm of the suction mount adjusts vertically and provides 360-degree rotation, providing flexibility in viewing the smartphone from any angle. To install, simply clean the mounting area with the included alcohol pad to ensure an optimum grip, then set the pedestal and push down on the one-touch lever to engage the suction. In order to prevent permanent indentation marks on dashboard surfaces made of soft vinyl, leather, or similar materials, Arkon recommends using the included 3M adhesive mounting disk. While powerfully strong, the sticky suction mount is also easily removable and reusable. If it has a drop in suction, just rinse the pad with a mild liquid soap and warm water, and then let air dry to restore the suction. If you have any questions about this product by ARKON, contact us by completing and submitting the form below. If you are looking for a specif part number, please include it with your message.